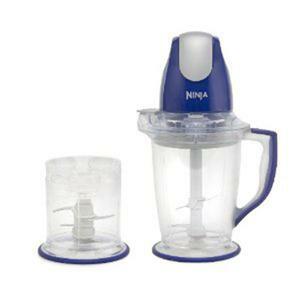 Ninja Food & Drink Maker... Rule the Kitchen with this revolutionary food and drink maker. Transform ice cubes into perfect, creamy frozen drinks and desserts in the blink of an eye. Make perfectly chopped salads, salsas and dips quickly without fear of uneven chunks or worse - turning the whole thing to mush. The powerful, interchangeable Master Pod easily switches from the Mini Master Prep (ideal for chopping) to the Master Prep Pitcher (perfect for frozen drinks and smoothies). Includes two convenient storage lids keep your creations long lasting and fresh. Includes Interchangeable Master Pod, 48 oz. pitcher with easy flip pour spout and no slip bottom, Ninja Blades and Splash Guard, 2 cup bowl with Ninja Blades and Splash Guard, Storage lids for both pitcher and bowl, Recipe Book, Quick Start Guide. 400 Watts.